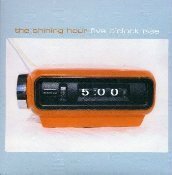 The song 'Five O'Clock Rise' was recorded on a Tascam Porta One in February 1986. The drum machine used was a Korg DDM-110 and the harmonica sound was played on a Yamaha DX100 keyboard. The guitars used were my trusty Eko 6 string acoustic and Aria Cardinal Black 'n' Gold. The other three songs were recorded on a Tascam 488 eight track between July 1996 and March 1998 using a Boss DS-330 'Dr. Synth' as the sound source for the drums and keyboards which were sequenced using Music-X 2.0 running on an Amiga 1200. The above guitars were used in addition to a Rickenbacker 330 and a Marlin bass. Thanks to Martin, Johannes and Hanns-Christian at Apricot, Tobias for the mastering, Mariko for the design, Hanne for the photographs and Andreas for the alarm clock. A special big thank you to Hanns-Christian for his support and friendship. I get the impression that Mark Cohen has hundreds of grand, sweet pop songs in his head, if not his basement, so the four on this Apricot single may not add much to the fifteen on Wait All Summer, but if the hand-writing is to be believed, my copy of this 800-count limited edition is number 666. The Satanic hidden message so far eludes me. 33, in a bewitching mango.